In a previous article it was argued that the EPA’s RadNet radiation detection network suffers from a lack of maintenance, improper calibration and zero credibility. That article also named the company responsible for the proper maintenance of RadNet and showed the political ties that may have helped land the no-bid contract. A system so essential to informing and protecting Americans during a radiation event fails at a time of need. Why is this? Just how hard is it to maintain what is essentially an Ethernet computer network with a few dozen workstations connected to a radiation sensor and a few servers ? The “amateurs” over at the Radiation Network set up a simple version of the system with all volunteers in response to the emergency and at last check they were 27 stations strong. In order to understand the current situation it is necessary to first explore the hows, whats and whys of RadNet. 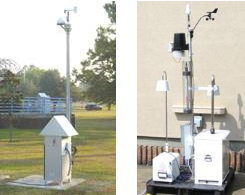 Fixed Air Monitors: Permanently mounted and continuously operating, each fixed monitor contains a high-volume air sampler, gamma and beta radiation detectors, and a computer that controls the monitor and sends data to a central database at least once an hour. The individual detectors within each monitor can discriminate between different types of radiation, including those that are naturally occurring. See the left side of Figure 1. Deployable Air Monitors: Deployable monitors are portable and can be used for exercises and for rapid deployment in response to real events. The monitors have high- and low-volume air samplers, a gamma radiation level monitor, a data logger, and telecommunication systems that send data to the central database. Although deployable monitors do not discriminate the energy of gamma radiation, they do provide gamma exposure rates. See the right side of Figure 1. The monitoring stations are in constant contact with a central server through telephone, ethernet, cellular and satellite links depending on the location and circumstances. Collected data is sent to the central server at prescribed intervals and is incorporated into a database that contains data from all stations. Historic and current data can be compared and viewed in numerical or graphical format. When a monitoring station fails to send data to the server at a prescribed time the software is designed to make a notification. When a station sends data over a predetermined limit a notification should be sent. If a self-check of the computer at the station determines there is a malfunction, a notification should also be sent. This can be accomplished by an entry into a computerized log or an email/page to an on-call technician. Either none of these notification systems were in place or the EPA knew of the problems and did nothing to resolve them. 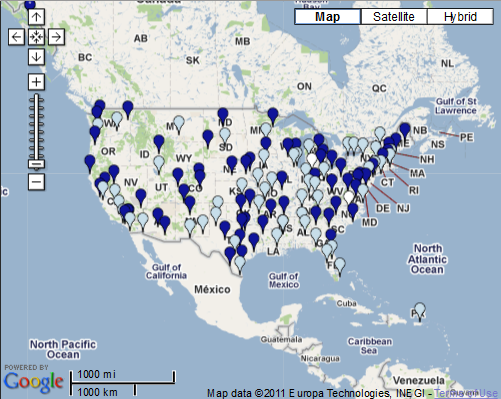 Dark blue pins show recently updated data. White pins show monitors that are temporarily out of service. 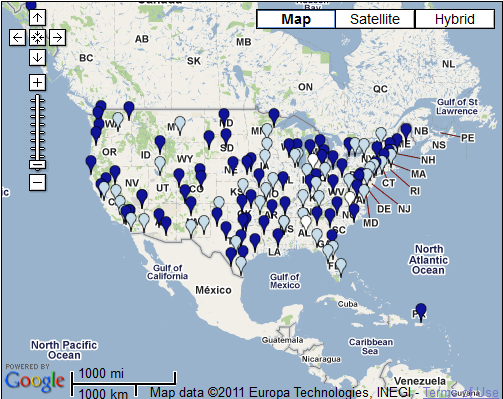 Light blue pins mean the data is being reviewed at EPA’s National Air and Radiation Environmental Laboratory. It is evident from the three maps above, downloaded over a period of five days, that there are a high number of stations where “data is being reviewed”. Quite a few are the same stations all three days. The stations in Fort Wayne, Indiana and Raleigh, N.C. have been out of service for multiple days during this period. During the first week after the radiation started spewing from Fukushima there were almost a dozen stations that were out of service and at least 5 of them were on the west coast. Any attempt to access data from the “online” stations oftentimes resulted in bogus data or no data at all. Just as disturbing is the EPS’s claim that if a station is offline another nearby station would pick up the slack. The RadNet stations sample air that is available locally. They do not scan at any distance. If a station in Idaho Falls goes offline (which it has) the next nearest station is in Salt Lake City which is 200 miles away. The air nor the weather is the same in these two places. A section of the EPA RadNet website is devoted to publishing data collected from the stations via quarterly reports, however this has not been done for some time. The first report published at the site is July – September 1991. The last report available on the site is July – September 2009! Where is the data from September 2009 to March 2011? EDI, (the company with the EPA contract to maintain RadNet maintenance) should be investigated and the owners should be held responsible for allowing America to be unprotected from a radiation event such as Fukushima.